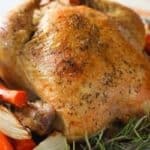 This Easy Roast Chicken is perfect in it's simplicity! Once you learn how to make this, you can feed yourself and your family for years to come! Use the leftovers for all kinds of recipes! Line a roasting pan with foil for easy clean up if desired (I always desire this!). Remove giblets from cavity of chicken along with any excess fat and discard. Rinse inside and out and pat dry with paper towels. Stuff cavity with rosemary, lemons and garlic. Tie legs and tuck in wings of chicken. Stack vegetables on roasting pan and set chicken on top. Roast for about 1 to 1 1/2 hours until meat thermometer (placed between thigh and breast) reads 165 degrees.